When was the last time you had your foot measured to check your shoe size? According to a U.K. study in where 2,000 adults were surveyed, one-third of men and about half of women admitted to purchasing shoes that don’t fit properly. Not wearing properly fitted shoes is not only an uncomfortable decision but also a decision in which brings a number of negative health effects. Not wearing your correct shoe size can actually lead to bunion growth, hammer toes, foot pain and back pain. One of the best ways to prevent foot pain and foot problems from developing is to make sure you are wearing your correct shoe size. In addition, our shoe size tends to change with age, weight gain, disease and sometimes injury. For this reason, it’s critical for you understand the importance of measuring your feet yearly. Regardless of how long you’ve been buying and wearing the same pair of shoes in the same size if you want the best fit, you should get your feet measured in-store about once a year. Your foot changes throughout your lifetime, so it is always good to measure your feet with a Brannock Device when purchasing new shoes. Click here if you would like to schedule a free shoe fitting and gait analysis. 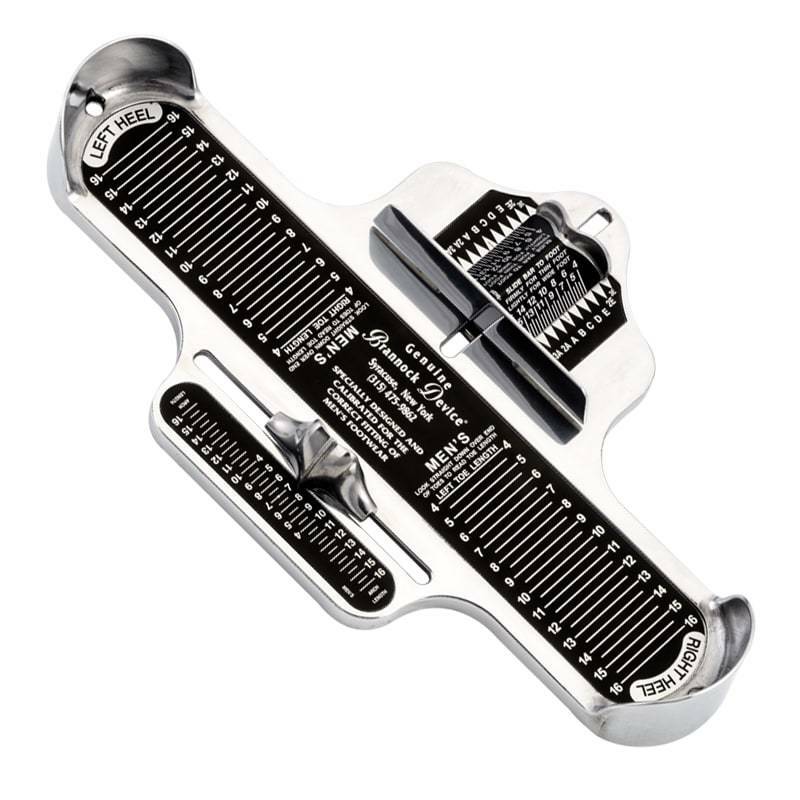 The Brannock Device is the standard foot measuring tool for the world’s footwear industry. However, many shoe stores have neglected to use the Brannock Device to perform solid foot measurements of their customers’ feet. Consequently, leaving their customers to choose shoes on their own and many end up selecting improperly fitted shoes. Over the past years, the Brannock Device has become an outdated device and many people can’t remember when was the last time they used one to get their correct shoe size. However, not Lucky Feet Shoes! We take our time in fitting you into your correct shoe size through our Free Foot Analysis and Shoe Fitting. 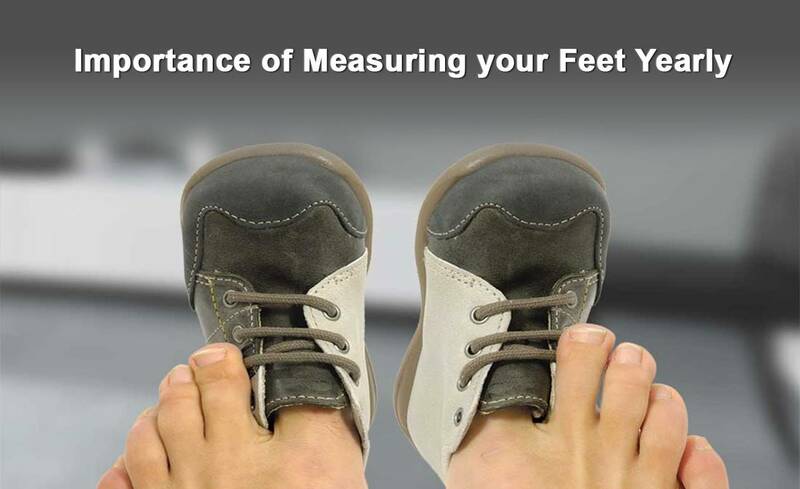 We understand the importance of measuring your feet yearly for your correct shoe size. Why schedule a Free Foot Analysis and Shoe Fitting? Not everyone can correctly self-determine their shoe size. So leave it to the professionals! We are happy to help! Our free foot analysis will help you discover the right comfort shoes, walking shoes, running shoes or custom orthotics for your feet. Our trained staff can determine your foot type and the nature of your gait (the way you walk & run). Based on the results, we offer solutions tailored to your specific needs! Having the right products for your foot problem is the best way to reduce pain and increase comfort. Click here if you would like to schedule a free shoe fitting and gait analysis. What if I want to self-determine my shoe size? Depending on your preference, whether you prefer a professional fitting or self-determine your shoe size; we can help you! If you prefer to self-determine your shoe size, keep reading. When you are trying on shoes, generally you should have about a half-inch of space between your longest toe and the heel counter. As you try them on pinching the toe is a common practice, but you should also slide an index finger behind your heel. If it doesn’t fit, go a size up; if it slides into the shoe easily, you should probably drop a half- to full-size. Here are a few tips you can use when buying your next pair of shoes. Shop for shoes at the end of the day when your feet have already expanded. Wear the same type of sock that you’ll be wearing the shoe you are shopping for. FYI: A thick sock or thin dress sock can influence the fit more than you think. Width is often as important as length, so make sure the shoe fits in every direction. If you fall in love with a pair that’s slightly too big, try them on with insoles. Come into any one of our stores located in Costa Mesa, Anaheim Hills, Rancho Cucamonga, Riverside, San Dimas, Long Beach, Temecula, La Quinta and Palm Desert! Visit us today to purchase your Free Shoe Fitting and Foot Analysis! If you are searching for Free Shoe Fitting and Foot Analysis in Anaheim, Anaheim Hills, Yorba Linda, Brea, Orange, Placentia, Costa Mesa, Santa Ana, Fullerton, Irvine, Villa Park or Tustin, then visit our store in Anaheim Hills or Costa Mesa. If you are searching for Free Shoe Fitting and Foot Analysis in San Dimas, Long Beach, Cerritos, Glendora, Pomona, Covina, West Covina, La Verne, Azusa, Diamond Bar or Claremont; then visit our store in San Dimas or Long Beach for your footwear needs. If you are searching for Free Shoe Fitting and Foot Analysis in Rancho Cucamonga, Ontario, Upland, Fontana, Rialto, Chino, Chino Hills, Mira Loma, Eastvale, Colton or San Bernardino; then visit our store in Rancho Cucamonga for your footwear needs. If you are searching for Free Shoe Fitting and Foot Analysis in Riverside, Moreno Valley, Corona, Rubidoux, Loma Linda, Grand Terrace, Redlands or Norco; then visit our store in Riverside for your footwear needs. If you are searching for Free Shoe Fitting and Foot Analysis in the Temecula Valley, Murrieta, Fallbrook, Lake Elsinore, Wildomar, Hemet, San Jacinto, Pala, Sun City, Menifee, Canyon Lake, Perris, Bonsall or Anza; then visit our store in Temecula for your footwear needs. If you are searching for Free Shoe Fitting and Foot Analysis in Indio, Coachella, Thermal, Vista Santa Rosa, Valerie; then visit our store in La Quinta for your footwear needs. If you are searching for Free Shoe Fitting and Foot Analysis in Cathedral City, Thousand Palms, Palm Desert, Palm Springs, Desert Springs, Rancho Mirage or Bermuda Dunes; then visit our store in Palm Desert for your footwear needs.